Smokey Bones Bar & Fire Grill, 2911 Vineland Rd, Kissimmee, FL. More locations. Smokey Bones bbq has always been a good place to eat. They came out with a Late-Night menu that worked into my schedule on a Saturday night to make a visit. Great prices and nice choices that last from 10pm until close every evening. I like eating at their bar. A large wrap around bar with a multitude of TV’s, some hi-top tables and booths are available as well as their dining room. I’m pretty finicky when it come to burgers, but theirs never disappoint. The LN menu offers a 1/2 lb Premium Burger with cheese, none of the others are offered on this menu, but for 7 bucks, I don’t need avocado and bacon. They are cooked to order and I love that. Let’s add Smoked Wings $7.00, and the Loaded Cheese Fries $5.00. A beer seems the perfect pairing for this mix, and they were having a special, $2.95 for a Blue Moon. Score! The cheese fries came first and dang, they looked amazing! A hefty amount of seasoned French fries covered in cheddar jack cheese, bacon, chipotle mayo, sweet BBQ glaze, green onions, tomatoes, and ranch dipping sauce. Yes, it could be an entire meal and you’d be completely happy, just wash it down with beer and it’s all good. My PIT (Partner in Crime) wasn’t sure about the sweetness of the bbq sauce on it, but after a few bites, I had a hard time keeping up! Damn, I want some now…my is watering! The chicken wings came and they were very good. I probably would have like them better naked, instead of the sweet glaze on them. I like to dip into my own sauce, because if you don’t like their sauce, the whole plate is ruined. Nice hint of smoke though. The burger arrived and it was cooked to perfection! Not many can get the Rare temp correct, but they mastered it. It has your basic sides, lettuce, tomato, red onion, pickles. I put some ranch dressing on it and it was on! Delectable burger. Lots of flavor and a tummy full of happiness. Go to smokeybones.com and view their Late Night menu. It’s a good one for late night noshing. Super specials throughout the week from their regular menu, lunch and dinner. Their best Sammy is the Pulled Pork and it is on the menu for $6.00. You can’t barely get a crappy fast food sandwich for that! Cid’s Filipino Restaurant, 1328 N John Young Parkway, Kissimmee, FL. I was searching for a good Filipino restaurant since eating at one in Chicago and again watching Andrew Zimmern enjoying some Crispy Pata. It was time to delve back into some awesome Filipino eats and I came upon Cid’s. Cid’s is located in a strip mall right off the main drag in Kissimmee, John Young Parkway and Hwy 192/ Vine St., a suburb of Orlando. It’s a little hole-in-the-wall, but generally those venues create the best food. An interesting menu, it was time to have a new experience. Definitely the small cigar looking Lumpia, (spring rolls and eggrolls are my jam) these will be right up my gullet alley. Siopao(steamed bun) and Lechon Kawali (pork belly) will round out this lunch. This is a pretty basic introduction into Filipino food if you’re a beginner. All three choices come with their own sauce, which I love. I’m a saucy chick. Everything looked amazing and made my mouth water. First up, the Lumpia. Oh yes, crispy outer with a nice filling of ground meat and spices. The sauce was very mild, so I dipped them in sweet chili sauce when I got home. Excellent! The Siopao (Special asada) was filled with a mixture of chicken, pork, Chinese sausage and egg. Delicious! Big, squishy, warm and a good amount of filling for a steamed bun. So tasty, with good sauce. The Lechon Kawali is in a word…..awesome. Crispy skin, flavorful, fatty meaty pieces of pork heaven dipped in a golden sauce. I was told they have a customer who uses it to make tacos at home. Great idea! Sooooo good. Very warm and welcoming people at this restaurant. Thoughtful with their food, and even packing it to go. To keep the integrity of the food, they cut an opening in the top of the container. Magical idea! I will be back for their Crispy Pata next time, and their Daing Na Bangus. It is a whole fish that is marinated and fried. Freaking fabulous! Hours: CLOSED MONDAYS. Tues: 11:00am – 6:00pm, Wed – Sat: 11:00am – 8:00pm, Sun: 11:00am – 5:00pm. ** Last Dine-In 30 minutes before closing. Keke’s Breakfast Cafe, 345 W Fairbanks Ave, Winter Park, FL. Other locations around Orlando, Central and South Florida. Sunday morning, rainy and cool. I need breakfast and a visit to Keke’s is just the place to fill the bill. Keke’s is a breakfast and lunch only restaurant. They have a large menu and when everything sounds soooo darn good, making a decision seems like an epic chore. Start me off with coffee and let’s go from there. Good coffee, by the way! Belgian waffles, pimped out waffles, pancakes (dinner plate size), pimped out pancakes, French toast, stuffed French toast, eggs, omelets, ….oy. Everything looked amazing to my starving belly. I’m feeling like something sweet with savory on the side. I went in hard for a Banana, Nut, & Caramel Waffle. A beautiful masterpiece. Banana and pecans baked inside the waffle, topped with more banana and pecans, then add caramel drizzle, whipped cream, and powdered sugar, Sugar! Wow. Hey, don’t stop there. You MUST add maple syrup to get the entire scrumptious layers of flavor. Yes, do it. Also ordered were their pancakes. Gigantic pancakes. Eggs and bacon. Former patrons had said, their pancakes were enough for 2 people. I’m saying, they are correct. The taste wasn’t anything special, regular pancake mix flavor. The bacon was excellent and the eggs were fine. If you’re a picky eater, get this basic breakfast. If you’re adventurous, get a souped-up, pimped-out waffle, pancake, or egg dish. They know how to put some bang in your breakfast! Hours: 7:00am to 2:30pm daily. http://kekes.com to peruse their breakfast AND lunch menus. I was gifted a kit of 7 cheeses from the Sartori Cheese company in Plymouth, Wisconsin. They make lovely artisan cheese and use Wisconsin cows! Immediately I put my creative foodie hat on to see just what different ways I could use them beyond a knife and a glass of wine. the cut sides (so the sugar from the glaze wouldn’t burn), laid one half buttered cut-side down in skillet, top with slices of Espresso BellaVitano, top that with the other half of buttered doughnut. Grill like any other cheese sandwich. Watch out, it may be addictive. Boom! How about some protein after that sandwich?! Let’s try a beautiful egg scramble with sautéed onion, jalapeno sausage and topped with Extra Aged Goat Cheese. The creamy egg, sweet onion, and spicy sausage, married perfectly with the tangy and earthiness of the goat cheese. The cheese also helped to calm the fire from the jalapeno. I served tomato salsa on the side for brightness and color. Bold and brilliant! The Dolcina Gorgonzola had me salivating just thinking about all of the tasty treats I could try. Nothing could stop me from making a Gorgonzola Cheese Cream Sauce. It is multi-purpose! I used a basic Bechamel recipe, made a roux, added cream, then finished with Gorgonzola, salt and pepper, then a bit of nutmeg. Holy Toledo Batman, sinfully good! This dish is pasta, topped with sautéed mushrooms, then finished off with Gorgonzola cream sauce and sprinkled with basil. Later, I will top off a burger with this sauce and a few crumbles of Sartori’s Gorgonzola. This is also a fantastic sauce to put on a steak. It is so special, and so smooth. I could bathe in this sauce. Oh my! 1 Tablespoon of your favorite fresh herb or spice. If using dried herbs, use a smidge less, especially when using a strong flavor. I used nutmeg IN the sauce, and dried basil last, to top off the dish. Remember, taste test along the way! Cook pasta as directed on box, drain, cover and set to the side. Melt butter over med-high heat in a med pot. Once melted, add flour and whisk. Cook until flour turns a light brown color, about 4 minutes. Slowly whisk the Half and Half into the roux. When it is all incorporated it will be thicker, but not completely thickened. Turn down heat to low and simmer until thicker, about another 4 or 5 minutes. Stir in Gorgonzola until melted and keep warm until needed. Taste for salt and pepper. In a separate pan, saute your mushrooms in a bit of olive oil, cook until just tender. Place pasta on serving platter, lay the mushrooms on top, then ladle on the cream sauce and finish with a few shakes of dried herbs…basil or rosemary are nice. Quite honestly, the Raspberry BellaVitano, Merlot BellaVitano, and the Limited Cognac BellaVitano are all incredibly delicious cheeses on their own. A charcuterie board with these 3 cheeses, slices of pear, apple, dried apricots, dates, olives, nuts, honey, crackle bread, fig jam, and prosciutto would make a perfect Holiday appetizer for my guests. Add wine and we’re good to go! The Asiago with Rosemary and Olive Oil will be sitting atop an Italian red sauce with melted anchovies and plenty of garlic over gnocchi. My mouth is watering already! Sartori’s artisan cheese is superb, a definite must-try for any cheese lover. High quality, beautifully made, phenomenal flavor. 5 out of 5 stars! Go to their website and peruse their story, cheese, and recipes. Carnitas’ Snack Shack, 12837 El Camino Real in Del Mar, San Diego, CA. 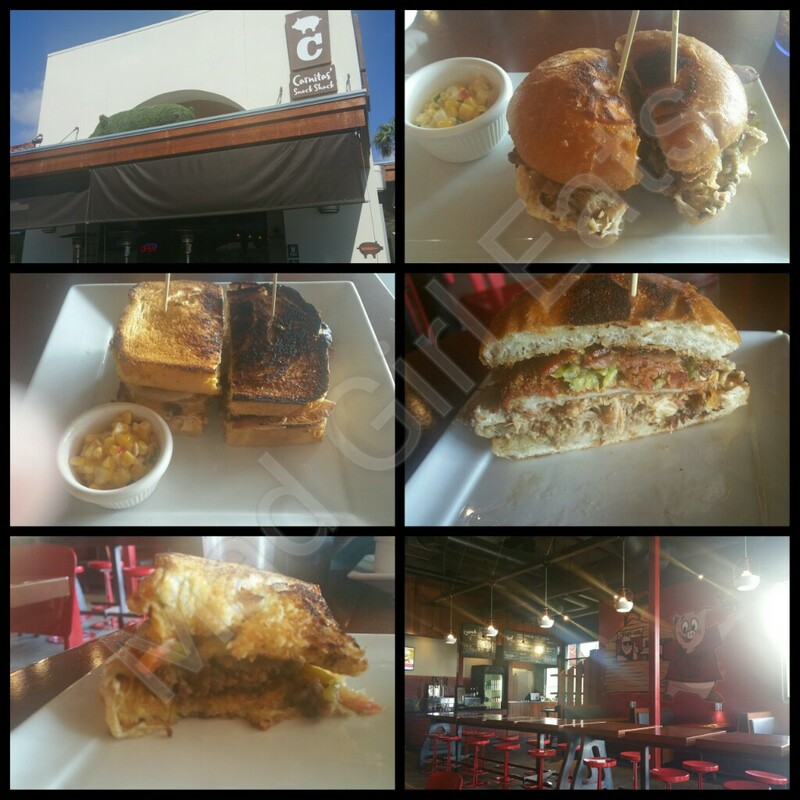 A pretty little bbq spot in a pretty little area of Del Mar in the northern San Diego area. Cool “Q” dining area with outdoor seating available. I ordered the Triple Threat Pork Sandwich and the Snack Shack Steak Sandwich. Both were meaty and flavorful. 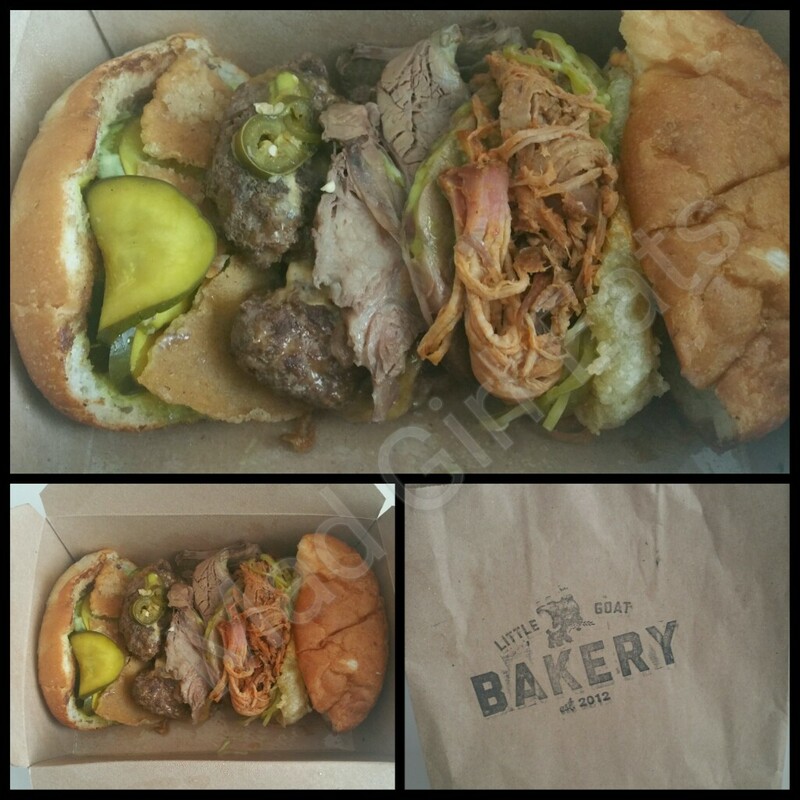 The Triple Threat Pork sandwich was brilliant. It had pork loin schnitzel (wow), pulled pork (yum), and bacon (heck ya!) with a pepperoncini relish and Shack aioli. Dang! That was a pork masterpiece! The Steak sandwich was delectable. Sliced ribeye, pepper jack cheese, tomato, pickled serrano, chipotle aioli, and jalapeno. It was bounding with flavor and heat from all of the peppers. If you like it caliente’, you will love this! Located in an upper crust strip mall with easy and plentiful parking. There is also a shack located in North Park. Great flavors, quality eats. New hours: Sun – Thurs 11:00am – 9:00pm, Fri – Sat 11:00am – 10:00pm. 4.75 out of 5 points. 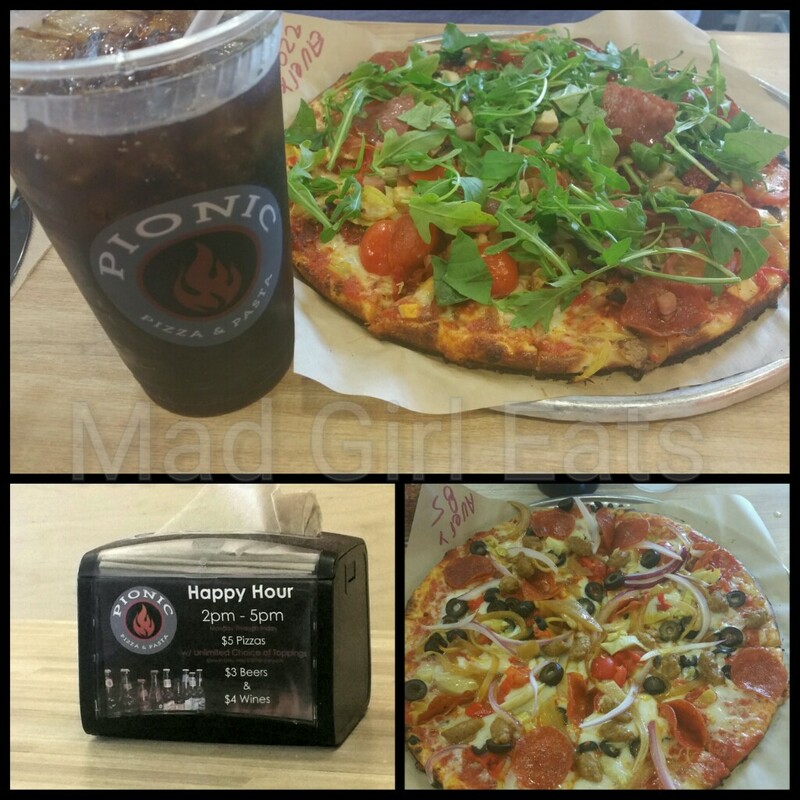 Mad Girl Eats Pionic in Tucson! Pionic Pizza and Pasta, 2643 N Campbell Ave #105, Tucson, AZ. Pionic is a new, unique place for artisian pizza. It is like Chipotle for pizza lovers, also offering pasta and salads. Walk up to the long counter, choose your crust (gluten-free available), and unlimited toppings of meats, veggies, cheeses, and herbs. It then gets thrown into a mega oven and is finished in 90 seconds. It is crispy, light, and oh-so-delicious! Great tasting pizza, any or all the toppings you wish, and walla, you have a pizza engineered to your specifications! All ingredients are fresh, and you can taste it in the final product. Nice prices, cordial staff, and cool atmosphere. Don’t miss Happy Hour, Monday – Friday from 2pm – 5pm, pizza, beer and wine deals! Excellent! 5 out of 5 Perfect pizza points for the price! Mad Girl Eats Little Goat Diner in Chicago! Little Goat Diner, 820 W. Randolph St, Chicago, IL. Located in Chicago’s West Loop. Little Goat Diner is the little sister resto of Stephanie Izard’s mega famed Girl and the Goat restaurant across the street. You walk in and the interior is far from any ‘diner’ I’ve ever seen.Think chic industrial. Super busy per usual at lunch time, I opt for a sandwich to take out and am directed to the Bakery bar area. After perusing the menu, I decide on a signature goat item, the Goat Almighty. As you can see by the photos above, it was aptly named. I opened it up and was like….Holy Toledo Batman, this is a gargantuan burger! How do you even begin to eat it?! Let me lay it on you….it consists of a goat burger, braised beef, bbq pork, pickled jalapenos, salsa verde, onion rings, cheddar cheese, and pickles all inbetween a yummy bun. The only way I could possibly take a bite is by halves…top and bottom. It was fantastic, but the only thing I couldn’t get was a good overall sense of all components in one bite and how they worked together. Other than that, it was good! Little Goat offers an awesome menu for Breakfast, Lunch, and Dinner. Diner food twisted into something special. My next trip back I want to try a Pork Belly Pancake, a Smoked Pork and Toffee Crunch Shake, a delight from the Bakery, or maybe something coo coo crazy from their Breakfast menu which they serve all day. I love that! Diner Hours: Sun – Thurs 7:00am – 10:00pm, Fri – Sat 7:00am – 12:00am Bakery Hours: Everyday 6:00am – 6:00pm. Don’t be surprised if wait time for a table is an hour. Reservations accepted for Dinner only. 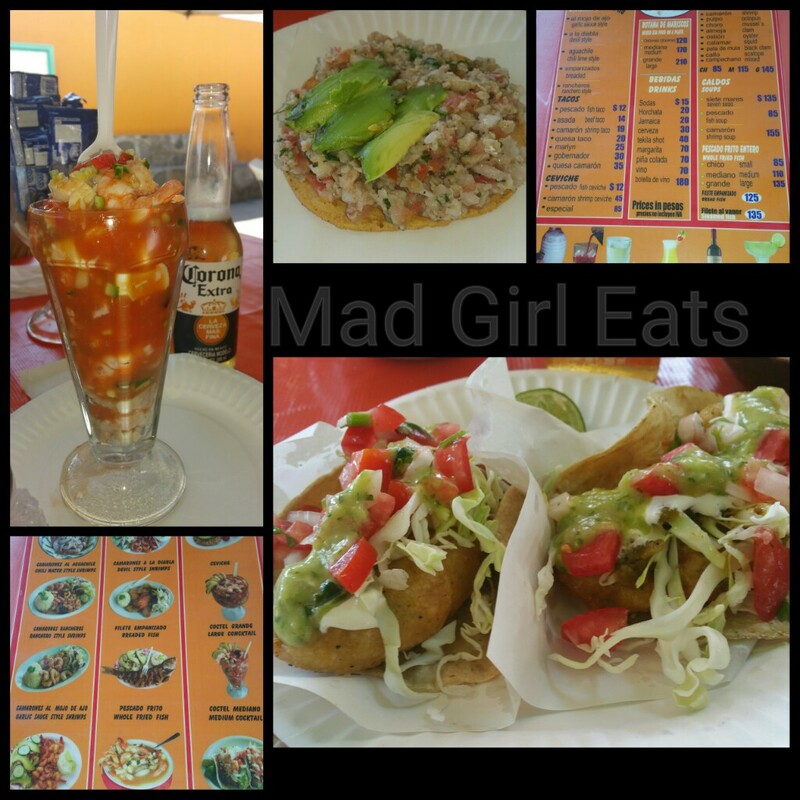 Mad Girl Eats Ray’s Drive Inn, San Antonio! Ray’s Drive Inn, 822 SW 19th St, San Antonio, TX. 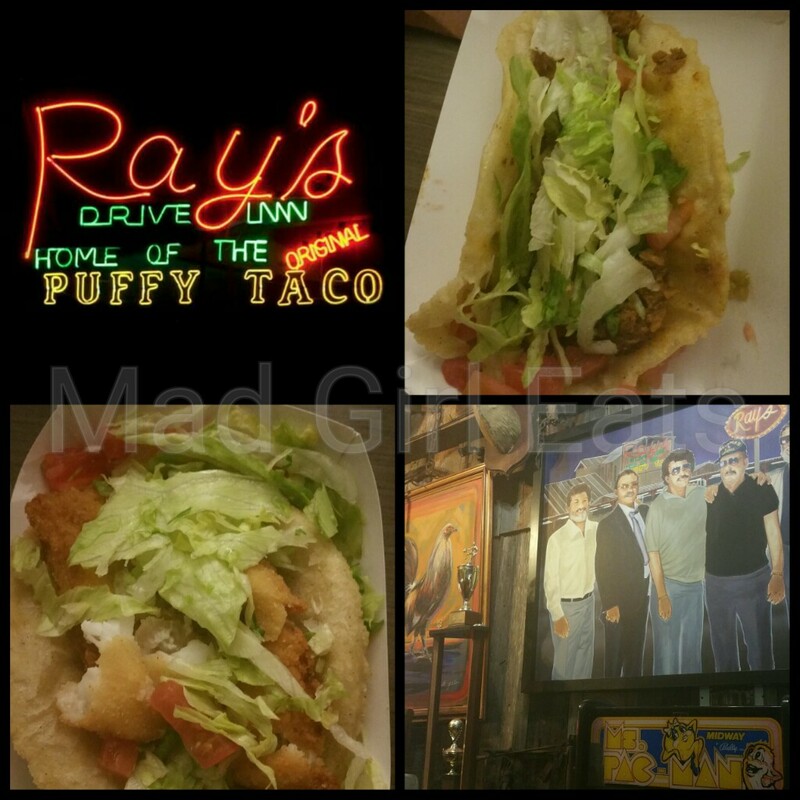 Ray’s is Home of the Original Puffy Taco. When traveling, I try to visit local eateries that features that area’s specialty. The puffy taco is one in San Antonio. Ray’s is a fun, quirky, welcoming landmark in the city since 1956. Don’t let the name fool you, go inside the restaurant to eat. They do have a drive thru, just don’t think it will be like Sonic when you pull up. I ordered one beef and one fish puffy taco. Oh so good. That puffy shell is amazing! The beef filling was savory and a blast of flavor. The fish was good, but not the powerhouse I found in the beef. Excellent quality, great prices, super staff, and entertaining atmosphere. Ray’s was a special place and I can’t wait to return. Hours: Tues – Thurs 11:00am – 11:00pm, Fri and Sat 11:00am -midnight, Sun 11:00am – 11:00pm. CLOSED MONDAYS. 4.75 out of 5 puffy taco points.